Green Tea Infused Lotions fight the affects of the environment on your skin! Green tea protects against sun (UVB) damage and environmental impacts on the skin. Because of the strong anti-inflammatory and vasodilation (increased blood flow) properties of green tea it makes it an excellent ingredient in body lotions and face cream. When you suffer sun damage, such as sun burn it will reduce the inflammation and increase blood flow to the area encouraging quicker cellular repair then if it is left on its own. The oxygenation to the skin makes skin smoother, firmer and brighter. We have found that green tea has a cooling effect on the skin giving burned or irritated skin instant relief. Make sure and pack a bottle in your beach bag. *It is no suggested that you use the Citrus Splash when spending large amounts of time in the sun. Some people can become photosensitive with the use of citrus on the skin. Our green tea infused lotions are handcrafted in small batches with the finest ingredients including green tea butter, cranberry seed and babassu oils, high in antioxidants they offer the benefit of fighting free radicals. Shea butter, palm butter and jojoba hydrate and nourish. Pumpkin seed oil is the super fruit of anti-aging. 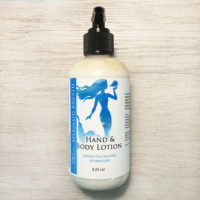 Combined together I have created this light weight, fragrant body lotion that will leave your skin feeling happy, hydrated nourished and soft to the touch. Keep a bottle on your night stand and apply to your hands and feet before bed to keep them soft and hydrated, or one in the bathroom to apply to your entire body just out of the shower. Your skin will thank you! !